Set II of the English Lyrics was published by Stanley Lucas, Weber in 1886 and was devoted exclusively to the poetry of Shakespeare. 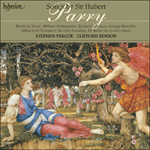 The entire set was dedicated to Parry’s wife, Maude (née Herbert), sister of the 13th Earl of Pembroke. Take, O take those lips away, sung by A Boy (to Mariana) in Measure for Measure (Act IV Scene 1), was completed in the autumn of 1881 and taken to Dannreuther for perusal. It received its first performance at Orme Square on 1 December that year along with My true love hath my heart (eventually destined for Set I) and one of the Four Sonnets, And wilt thou leave me thus. The singer was Anna Williams (soprano) with Dannreuther at the piano. As mentioned already, Parry’s song looks forward to the interactive sophistication of Wolf; indeed its aphoristic conciseness (covering but one page of music) seems uncannily to have much in common with Wolf’s late songs, notably those of the Italienisches Liederbuch. Parry’s miniature is an enchanting study in sensuousness. 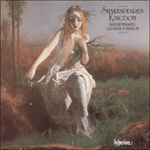 The welling up of desire is captured by the opening piano arpeggiations, while the metrical uncertainty of the singer’s opening statement captures something of the faltering passion implicit in Shakespeare’s lines. Yet more sensuous is the modulation to the flat mediant, marvellously initiated by the piano (‘But my kisses bring again seals of love, but sealed in vain’) and the splendid climax, while the sense of regret is poignantly captured in the conclusion where the piano is left to resolve the open-ended vocal line. No longer mourn for me, a setting of Shakespeare’s Sonnet LXXI, dates from 1874 and was composed at the same as the settings that were published in the Four Sonnets. The conception of the song was very definitely inspired by the English words even though Parry did consider a German version (the manuscript has German words added in pencil). Yet one suspects that the greater appropriateness of the English probably led to its being discarded from the bilingual scheme of the Four Sonnets, a fate which also befell another (unpublished) sonnet setting of If thou survive my well-contented day, also of 1874. The predominant influence in No longer mourn is that of Brahms, most particularly in the way the platitude of the cadence is avoided. The constant reiteration of the dominant (often as a pedal point) has the effect of maintaining the sense of agitation and insistence that haunts Shakespeare’s text, and is used with particular adroitness at the end of the final rhyming couplet (‘after I am gone’) to express a deeper sense of anguish.